Anyone who works with wood knows that the most time-consuming and often frustrating part of using a router is changing the bits. 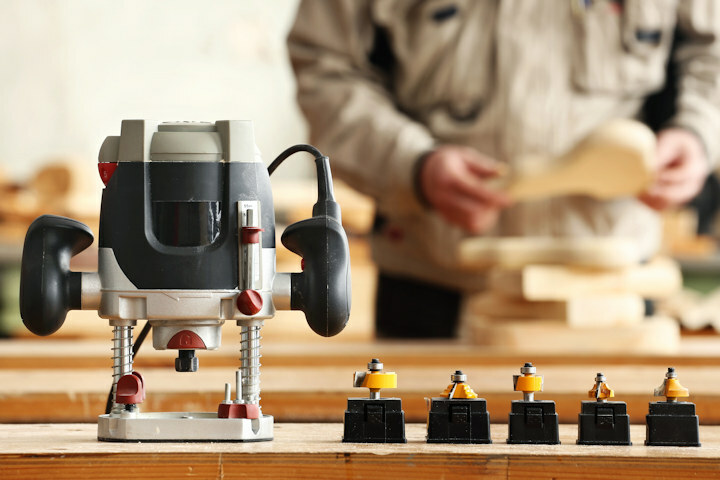 It’s especially difficult when using a plunge router, as the wrench must be inserted between the plunge posts and other parts of the machine. There are hundreds of different types of bits that can be used with wood routers and each creates a different effect on the wood. Most woodworkers hate dealing with stubborn router collets. If a wrench (or two) doesn’t go flying across the workshop, a hand or finger is easily pinched when trying to fit a straight wrench onto a nut that’s hard to reach. And if you own more than one brand or type of router, that means you also need a variety of different wrenches. Most router manufacturers include wrenches as part of the purchase. These tools are designed specifically for each brand and model, but that doesn’t necessarily mean they’re the easiest to use. However, with the ongoing advances in the technology of router designs, there are plenty of better wrenching options and tools on new router models. But what if you’re comfortable with your older router and just want to upgrade your wrenches? Here are a few choice picks for 2018. According to long-time woodworkers, this company manufactures some of the most popular router wrenches. Reviews of these tools are typically positive. The company offers wrenches in four different sizes that fit specific router models. DeWalt and Fein: size 7/8-inch straight wrench. Porter-Cable: size 1-1/8-inch offset wrench. Bosch, Makita and 2-1/4 hp Triton: 15/16-inch offset wrench. Hitachi and 3-1/4 hp Triton: 3/4-inch offset wrench. The wrenches are constructed of heavy-gauge plated steel and feature comfortable rubber grips. Porter-Cable: sizes 1 inch and 1-1/8 inch. Bosch: sizes 16 mm and 24 mm. DeWalt: sizes 19 mm and 22 mm. The 1-inch offset on these wrenches allows you easier access to the collet nuts. Infinity Tools has developed a new line of offset router wrenches that are designed to make changing bits on new and older router models easier. DeWalt and Fein: 7/8-inch wrench. Newer models: Bosch, Triton 2-1/4HP, Triton 3-1/4HP and Makita 15/16-inch wrenches. Older models: Triton 3-1/4″ and Hitachi ¾ inch wrenches. The wrenches in this new line are offset at a 90-degree angle, which provides easy access to the collet via the router plate. There’s no need to raise a table model above the surface to change bits. There’s no fast rule about having to use a specialized wrench to change your router bits. Using a standard flat or offset wrench to change bits works just as well. An open-end wrench of the right size will often work just as well or better than the wrench or wrenches included with the router. To properly size a standard or metric wrench for use on your router, simply take the collet to your local hardware store and fit it to the proper wrench if you don’t already own one that will work. This is a good idea even if you already have adequate wrenches. Some routers require two wrenches: one for the collet and a smaller one to prevent the shaft from turning. If this is the case, take the router with you to get a properly-sized set of backup wrenches. If you’re faithful to one router brand, such as Craftsman, several models have the same size collets. This makes finding or ordering the right wrench(s) even easier. Most woodworkers agree that changing router bits can be frustrating, time-consuming or even painful, but it comes with the territory. Using the right tools will not only make that job easier, it might prevent a bruise or two. Have you got a favorite type of router wrench? Definitely wouldn’t pay $96.93 plus shipping for an offset wrench!! Too overpriced!!! For the Wood River wrench, you indicated it was built from heavy-gauge plated steel. The same information for the other two suppliers would have been helpful. My experience has been that if thin gauge steel is used, the jaws of the wrench will open up and sometimes slip on the collett.